Alberto Del Biondi is founder and owner of Industria del Design, a company specialised in identifying strategies complementary to design in order to strike the consumer's imagination. The company's numerous customers include celebrated brand names such as Pirelli Pzero, Stonefly and Henderson. Passion for both design and the sea led Alberto Del Biondi towards the yachting sector in which he made agreements with the Permare shipyard to revisit the furnishings of a flying bridge Amer 86. The designer's intervention expresses the concept of "human design", aimed at the creation of environments that bring together pleasing aesthetics, functionality and essentialness. Following these guidelines Alberto Del Biondi, in collaboration with Tiberio Cerato, redesigned certain fundamental environments of life on board, such as the saloon which has also been modified with regard to choice of materials and matching of colours. Both externally and internally the predominant colour is grey. All the materials were treated to appear precisely this shade, from leather to bio-cotton, from coconut fibre to the oak of the furniture. The bridge was completely redesigned with view to improving functionality, rationalising the spaces to the full and concealing the air conditioning conduits. 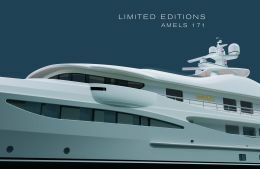 The Dutch shipyard Amels' new "Limited Editions" line will debut at the Monaco Yacht Show with the world preview of the Amels 171 designed by Tim Heywood and Laura Sessa. Well known for its custom motoryachts, the Dutch yard implemented this line to satisfy the needs of users who have an eye to saving, but above all to delivery times. This means that while maintaining its motoryacht quality, Amels will build limited editions on the basis of already existing hulls and architectures, leaving owners with the task of personalising all the rest. This solution results in considerable reduction in costs and time schedules. The first model of the series is the 52 metre Amels 171, designed by Tim Heywood on the basis of "Lady In Blue". The interiors were designed by Laura Sessa in a modern and eclectic style. For further information: Amels, Glacisstraat 165, 4381 SE Vlissingen, The Netherlands; tel. +31 118485002; fax +31 118485004; website www.amels-holland.com; e-mail info@amels-holland.com. Fino al 30 settembre, la struttura della Base Nautica Flavio Gioia di Gaeta, Latina, ha a disposizione 15 ormeggi per imbarcazioni fino a 50 metri di lunghezza e 6 metri di pescaggio, allestiti lungo il molo di sopraflutto del porto. Gli approdi sono completi di impianti idrici ed elettrici e rappresentano un punto di riferimento importante per chi naviga nel Tirreno, trovandosi in una posizione equidistante tra gli aeroporti internazionali di Roma e Napoli, offrendo inoltre la possibilità di accostare anche solo per il transito o per rifornimento di carburante. Inoltre, la Base Nautica Flavio Gioia offre numerosi servizi come assistenza tecnica e svolgimento di pratiche amministrative e doganali. Chi invece decide di ormeggiare per visitare il centro storico di Gaeta, non può perdersi il caratteristico quartiere medievale che si arrampica sulla collina di Monte Orland, il Castello Angioino-Aragonese e il Duomo. 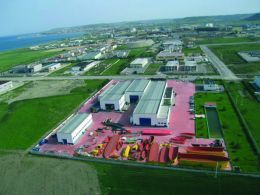 Per ulteriori informazioni: Base Nautica Flavio Gioia; Lungomare Giovanni Caboto 93; 04024 Gaeta (LT); tel. +39 0771 311013/311014; fax +39 0771 464580; sito web www.basenautica.com; e mail info@basenautica.com. Last April the Viareggio shipyard Benetti signed an agreement with Ultra Marine which now represents Benetti on the "Russian Federation Market". Ultra Marine, formerly Azimut dealer for the Russian market, will also be exclusive "sales e marketing agent" for the lines Benetti Tradition and Benetti Classic, which include motoryachts from 30 to 37 metres. 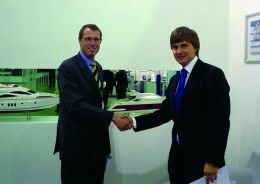 In confirmation of this agreement the two companies took part together at the recent Moscow Boat Show and will be present at Moscow Extravaganza 2005 in October. For further information: Benetti, via Michele Coppino 104, 55049 Viareggio (Lucca); tel. +39 0584 382227; fax +39 0584 396232; website www.benettiyachts.it; e-mail info@benettiyachts.it. 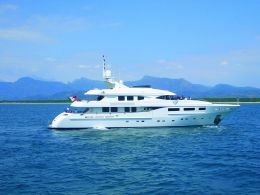 In the first six months of 2005 the Tuscan shipyard Benetti signed ten contracts for the building of the same number of yachts, a circumstance that confirms its position at the top level of this market sector. 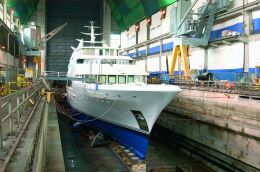 After the launching of the 56 metre "Galaxy", Benetti got down to building the 14th example of Tradition and the 29th of Classic, which will be delivered in 2006. Also next year the Viareggio yard will be delivering its sixth and seventh Vision, while between 2007 and 2008 it will deliver four new 59 metre motoryachts. Over and above the contracts mentioned above, Benetti has signed another two, one for a 57 metre designed by Andrew Winch and one for a 59 metre created with the collaboration of interior designer Redman Witheley. For information: Benetti, Via Michele Coppino 104, 55049 Viareggio (Lucca); tel. +39 0584 382227; fax +39 0584 396232; website www.benettiyachts.it; e-mail info@benettiyachts.it. On 29th June Benetti Sail Division launched the new model called 95' D "Evergreen". This motoryacht, completely in steel and aluminium, will be presented to the public in September on the occasion of the Festival de la plaisance de Cannes, and subsequently at the Barcelona International Boat Show. "Evergreen" is a "canoe stern" type displacement hull motoryacht, which is to say with a rounded and pointed stern typical of north European vessels, and is developed on three decks. The guest and crew quarters are below decks while the owner's suite, dining and relaxation areas are on deck. The upper deck has a covered area forward where the bridge is situated, and an open air extension aft with dinette, sunbathing cushions and the tender. The figures of this new model are: LOA more than 28 metres; beam 6.65 metres. For further information: BenettiSailDivision; Via Coppino 50, 55049 Viareggio; tel. 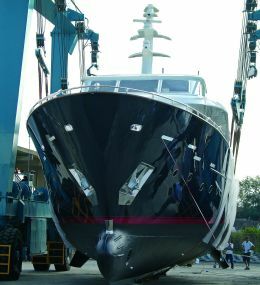 +39 0584 390194; fax +39 0584 387412; website www.benettisaildivision.com; e-mail benetti.sd@virgilio.it. On 24th June CNL president Annamaria Jaselli Ceccarelli, with daughter Laura and son Francesco, respectively Financial Manager and General Manager of the shipyard, welcomed about a hundred and fifty guests and customers to the evocative Cervara di S. Margherita Ligure on the occasion of Admiral Day 2005. A perfectly organised gala evening in the course of which, over and above confirming the upcoming launch of a new line of CNL displacement superyachts, the new brand image campaign was presented. The creative work of a staff of specialists, who normally work in the field of fashion and cosmetics, is undoubtedly effective. In certain aspects glamorous, definitely personal, and capable of expressing all the emotional added value of such an exceptional yachting griffe as Cantieri Navali di Lavagna. On 30th April at the Codecasa Tre premises, the motoryacht "Iliki VIII" was launched, the first model in the Codecasa 51 line. The new series of 51 metre motoryachts will replace the previous Codecasa 50 line. Adding a metre allowed the designers to renew the design, creating more thrusting and graceful forms. On the technical level this solution produced more space for the garage aft. The cockpit is designed like a veranda on the sea, an ideal environment for relaxation in the shade and meals in the open air, while the sundeck has a swimming pool, Jacuzzi and a lift that links the four decks. As regards its interiors, "Iliki VIII" demonstrates that it does not need to respect the usual canons. Respecting the owner's tastes, architects Franco and Anna Dellarole developed furnishings inspired by oriental style, created with a knowledgeable mixture of precious wood such as Tanganyika, palisander and birch. On the occasion of the launch "rumours on the quay" referred to a new collaboration between the Viareggio yard and Giorgio Armani, already a Codecasa boat owner. These rumours have it that the Milanese designer is working in person on the interior and exterior layouts of his new yacht. For further information: Cantieri Navali Codecasa Tre, Via Amendola, 55049 Viareggio(LU); tel. 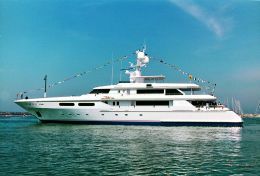 +39 0584 384092/3; fax +39 0584 384323; website www.codecasayachts.com; e-mail info@codecasayachts.com. 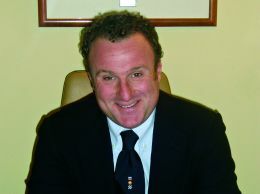 CRN, a yard specialised in the construction of steel and aluminium superyachts from 46 to 70 metres and from 29 to 43 metres in composite material marketed under the Custom Line trademark, has recently hired Vasco Buonpensiere as business manager for CRN brand pleasure craft in steel and aluminium. Vasco Buonpensiere steps into a yard belonging to the Ferretti Group after having gained many years of experience in the yachting sector where he has worked for brokers and in the business offices of important shipyards such as Royal Denship, San Lorenzo and Cantieri di Pisa. Buonpensiere will handle sales of CRN superyachts, which represent the top of the range both for the Ancona yard and the Group to which it belongs. For further information: CRN, Via Enrico Mattei 26, 60125 Ancona; tel. 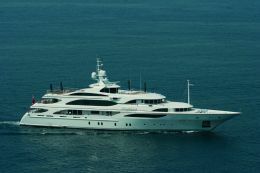 +39 071 5011111; fax +39 071 200008; website www.crn-yacht.com; e-mail info@crn-yacht.com. The English shipyard Devonport has taken on a new collaborator, Adam Fiander, who handles relations with the media and sector operators. Moreover, the yard will be at the 15th Monaco Yacht Show with the new motoryacht "Lana", a 77 metre developed on five decks and built in conformity with Lloyds and MCA standards. "Lana" has spacious and comfortable cabins for fourteen guests and twenty-four crew members. Among the special features we mention a helipad on the extension of the sundeck, a garage aft that can house a 13 metre tender, and a lift that links the five decks. For further information: Devonport Yachts, Devonport Royal Dockyard, Plymouth, PL1 4SG, UK; tel. +44 (0)1752 323311; fax +44 (0)1752 323247; website www.devonportyachts.com. Fipa Italiana Yachts has begun work on the new flagship of the Maiora line, a 43 metre three-deck motoryacht designed by architect Roberto del Re. The Maiora 43 TP has a semi-displacement steel hull whose profile rises at the bows to join the aluminium superstructure, creating at main deck level a "wide open" area forward for the owner's exclusive use. The new motoryacht stands out first of all for attention to detail and the finish of the interior, which consists of spacious areas, and then for the unusual design which goes beyond the usual Maiora production stylistic canons. The quarters developed on the lower deck are designed to offer high levels of comfort and privacy, with special attention also to the crew's requirements. The owner's area, in the forward part of the main deck, has a small apartment complete with separate office, relaxation corner, dressing table, wardrobe cabin and a spacious bathroom with Jacuzzi. Certain technical choices were dictated by this vessel's cruising ambitions, such as the galley and the pantry with its large freezers. According to the yard's estimations, the Maiora 43 TP can reach a cruising speed of 14 knots with a peak of 16.5 knots. For further information: Fipa Italiana Yachts, Via Sarzanese, 55054 Massarosa (LU); tel. +39 0584 97781; fax +39 0584 93118; website www.maiora.net; e-mail info@maiora.net. From 21st to 24th September Port Hercule, in the Principality of Monaco, will be hosting the 15th Monaco Yacht Show which, notwithstanding traditional canons, is dedicated exclusively to luxury and prestige shipbuilding. For the 2005 event there are numerous new items aimed at improving the exhibitory aspect of the trade fair. After seven years of progressive enlargement of available space, the Monaco Yacht Show has decided to definitively reorganise the infrastructures in order to respond more efficiently to exhibitors' and visitors' expectations. In particular, the overall area of the Show has been extended to 14.000 square metres, housing 530 exhibitors and 92 yachts on the water. At the Darse Sud there will be an air conditioned tent with an internal area of 3.200 square metres, housing the stands of 130 companies. In the Parvis Piscine area the air conditioned tent will be replaced by a bigger one with an area of 2.600 square metres, housing the stands of shipyards, designers, interior decorators and also the national pavilions. In the same area private airlines and top quality watch-making companies will be exhibiting. In the T Central zone there will be an 80 metre extension of floating pontoons for a total of 192 metres of berths, reachable by new access from the quay. 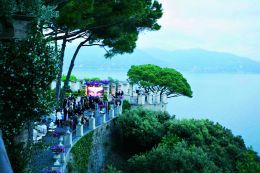 The Monaco Yacht Show thus renews the exhibition spaces, increasing its image of a luxury yacht salon. No less than 95 shipyards will take part, including 14 of the first 15 yards worldwide according to the Showboats International 2005 classification; 40 brokers, 55 marine architects and interior designers, 185 component manufacturers, 23 magazines and many other exhibitors. Among the 92 vessels in the water there will be a world preview of about 40 motor and sailing yachts. To celebrate the 15th anniversary the Principality of Monaco has printed a commemorative postage stamp bearing certain symbols of the Show. It is available at the Office des Emissions de Timbre-Poste of Monaco and at the entrances to the Monaco Boat Show. 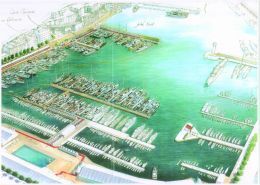 For further information: Monaco Boat Show, Le Panorama A/B, 57 Rue Grimaldi, MC 98000 Monaco; tel. +377 93104170; fax +377 93104171; website www.monacoyachtshow.com; e-mail info@monacoyachtshow.com. On 19th July, official presentation of the new Riva flagship, the biggest it has ever built: 115 feet, which is to say 34 metres of technology, design and luxury. After the press conference presentation in the new yards, we were all invited aboard. Attention to detail, minimalist design, traditional but aggressive lines and avant-garde materials ensure that this yacht will pass into Riva history. Terranova Yachts is cutting out an important slice of the market thanks to its special production centred around semi-displacement pleasure craft between 68 and 105 feet aimed at users who want to enjoy the sea serenely and with no hurry. The 85'Explorer is the first of three models that come under the pleasure craft category and they feature classic design, a reinterpretation of the cruising motoryachts of the 50's/60's. The classic is also the key element for the interiors, furnished with cherry boiserie and finished in satin lacquers. It should be said that the yard seeks classicality only in the design and interior decoration, whereas the project right from the first sketches grows out of special studies using sophisticated latest generation software. Construction involves the use of a monolithic structure in composite for the hull, while the superstructures are created with sandwich technology. All this, together with structural type compartmentalisation, means that weights can be reduced to a minimum without altering the qualities of toughness and of the overall structure. Moreover, weight reduction together with well designed lines on the water means that consumption is reduced with regard to performances in line with design expectations. For further information: Terranova Yachts, Porto di Lavagna Box 16/17, 16033 Lavagna /GE); tel. 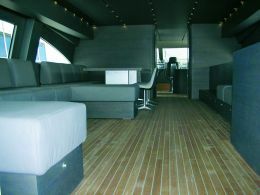 +39 0185 370164; fax +39 0185 368569; website www.terranovayacht.com; e-mail terranovayacht@tin.it. In March of this year Viareggiofucina began its qualitative training school for professionals who operate or will operate in the pleasure craft field. Viareggiofucina, a company whose partners include the Municipal Administration of Viareggio and the Association UCINA which unites important Italian shipyards and companies in the yachting sector, offers a broad training programme to everyone involved: officers and skippers, engineers and technicians, stewards, hostesses and chefs, managers and directors of yachting companies, electronics technicians and all qualified people who want to become professionals in this sector. The training programme is wide ranging and aims at meeting the needs and the cultural and training requirements evinced by the sector. The objective is to complete the managerial aspects of training for all professionals operating in the pleasure craft field by supplying them with high level qualifications. The study modules concern themes such as 'Management', 'Regulations, insurance and fiscal aspects', 'Administration and control', 'Organisational and management processes aboard and ashorè, 'Marketing', 'Customer satisfaction', 'Project management', 'Contract Management' and 'Languages'. The courses, which run from a minimum of two days to a maximum of five, are held on the top floor of the "Piaggia" Institute in Viareggio. For further information: Viareggiofucina, Via Coppino 116, 55049 Viareggio (LU); tel. +39 0584 389731; website www.viareggiofucina.it; e-mail info@viareggiofucina.it.